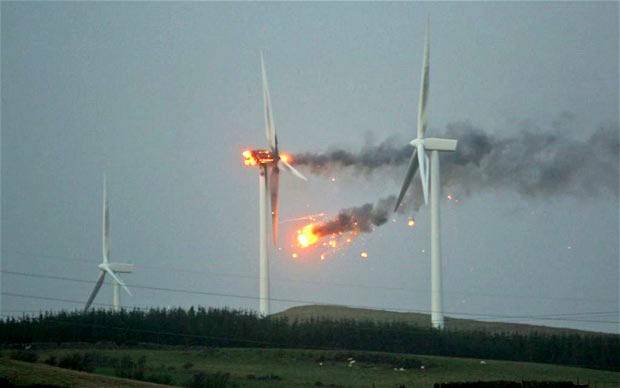 Capitalists@Work: Tory Windpower Policy - What's Cooking? Tory Windpower Policy - What's Cooking? True to its manifesto, the government has signalled an end to onshore windpower development. That is, of course, unless the wind industry somehow delivers on its claim to be 'near to grid parity with costs falling all the time', in which case they won't need subsidies ... I needn't go on. Even then, with increased powers - nay, obligations - for local planning authorities to take local protests into account, a hypothetical 'economically viable' windfarm might struggle to get consent. the SNP, as their entire energy policy is predicated on a very significant increase in Scottish onshore wind capacity, haha. The UK is more or less on course to hit its 2020 renewables targets. (I put aside the issue of whether 'achieving the target' is anything more than an arbitrary feat of civil engineering.) So beyond that, where does the government imagine it is headed with the 'green crap'? A cynic would say: no politician looks beyond the next election and - given the lead-time of big new developments - the die is already cast for 2020: in which case, the next 5 years is all about (a) keeping the lights on and (b) spin. they will manipulate the new Capacity Market to ensure new gas-fired plants get built. Any other reading of the runes? It seems like solar is advancing very quickly and could be affordable for every household in about 20 years. If batteries also get good the only use for the grid would be to channel excess power to industry. So why is everyone obsessed with wind turbines? Even if you're into green energy, wind turbines seem to be the wrong bet? I was always very sceptical about green energy but it now seems like we're in the equivalent of the 70s or early 80s of the computer boom. At some point it's all going to come together like in the late 90s and the change will probably be quick when it happens. This will also give the climate alarmists a get out of jail card because instead of admitting they were wrong they can instead claim they saved the world. Apparently Lockheed Martin have made a potential fusion breakthrough as well. As for the Scots, they control the planning system so there's nothing to stop them covering all those lonely glens with beautiful turbines. What a pity for them that there isn't some way of gleaning power from rain? That could provide year-round energy! I would say this, but as things move on so rapidly in technology terms, it makes even more sense to promote a free market and a diversity of investment, rather than pick a handful of "winners". Er.... BE, Hydro power does come from rain, and the Jocks do indeed have quite a lot of it. I go along with K (and previous ND comments) that solar PV looks likely to hit big time economics in a decade or so. It is pretty silly funding the enormously expensive Tidal Lagoon now, but stop the cheapest expandable green leccy generation (onshore wind) - but that's politics for you. Another rune is what happens to the post EDF EPR nuclear rush? The world's nuclear industry has been drawn to the UK like moths by the absurd prices the DECC nuclear lobby is willing to pay. Cambridge prof and ex-MD of of Rolls-Royce Nuclear claims the 5 Hitachi ABWRs at Wylfa and Oldbury + 3 Toshiba (Westinghouse) AP1000s near Sellafield will need a CfD price of around £76/MWh. The likely future Chinese proposal for Bradwell probably less. This is slowly moving toward a not-insane price for low-carbon base load. CFD's in Energy at that rate RWE will easily bankrupt the UK in the 2030's. Sadly I plan to still be alive then...better get building an overseas property portfolio. I bought some shares in LMT on reading that news about a year ago and as it seems to have gained in profile but no production date still - however, they are quite good at delivering complex things that kill people, so the sp has risen rather well and one lives in hope they can deliver something complex that helps people. On the swansea barrage, on RTFA, they have got outline pp, but no agreement on subsidy. Noting the subsidy there for nukes, I expect that any sane person would rather the money would be spent/wasted on this as the worst that can happen to a tidal barrage is that is does not work, whereas if there was if there was a tsunami like there was in 1607, the chances are bits of hinckley point would end up spread across south wales, somerset and Bristol and up to Gloucester. Indeed solar power has got to parity on a LCOE basis across many sunny countries already (not France!?) but the UK is not one of them. Even with another projected 40% drop in costs over the next 2 years there still needs to be base load. Perhaps Greece could export electricity. Reading tealeaves, I think deals with foreigners of any sort apart from the Chinese are a bit non-u (the evil things they do are a long way away). Small scale biomass seems to be a nice approach especially if it can accept the waste we produce rather than woodchip from estonia and it could produce baseload. Exactly how it is carbon - neutral escapes me. because it's deemed to be - so there! Solar PV can get as cheap as it likes, but there's one slight problem that seems to be ignored... It doesn't work terribly well at night (except in a couple of Spanish plants) and we get an awful lot of night in the UK in wintertime - when the load is at its heaviest, so PV can really only be seen as a "top up" system and is completely useless for anything else. Biomass? Wonderfully eco-friendly as long as you ignore the only way it can work is by razing Canadian forests and shipping the chipped wood across the Atlantic in big smelly poluting ships. The deforrestation of the South of England in Elizabethan and later times was largely caused by the need for wood for ship-building, and burning the stuff in quantities necessary to power a modern economy would need the complete reforestation of the UK to have any chance of keeping up. Tidal lagoons - a joke that doesn't even reach the "sick" stage. Fission - a damned-good solution. Base load, somewhat dispatchable, suffers only from HMG's ineptitude in negociating contracts at a sensible price (and maybe from over-heavy regulation). Basically, until fusion becomes a reality we need gas, lots of it.. That lovely stuff sitting under our feet. What is this 'lovely' gas sitting under out feet is this you talk of?